A craftsman is no better than the quality of his, or her, tools! 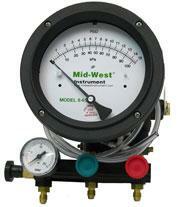 The most important of these is the differential pressure gage. Historically, two types of gages have been offered: bellows gages (accurate to within as little as 0.5% of gage readings), and diaphragm gages (accurate to within 2% of gage readings). We are pleased to be able to offer the reliable, light-weight and proven-in-the-field Wilkins TG-5 5-valve diaphragm gage. The Wilkins comes equipped with hoses, in-line hose filters, adapter fittings and an attractive and well-cushioned carrying case. Unfortunately, due to changes in testing procedures which have been adopted in some parts of the country, no manufacturer is currently making a high-precision bellows gage for use in backflow testing. PROMASTER PLEXIGLASS WINDOW 4 1/2"
PROMASTER BEZEL RING POWDER COATED 4"